Sure, we spend a lot of time looking at far-out gear and high technology, but you have to tip your hat to practicality. 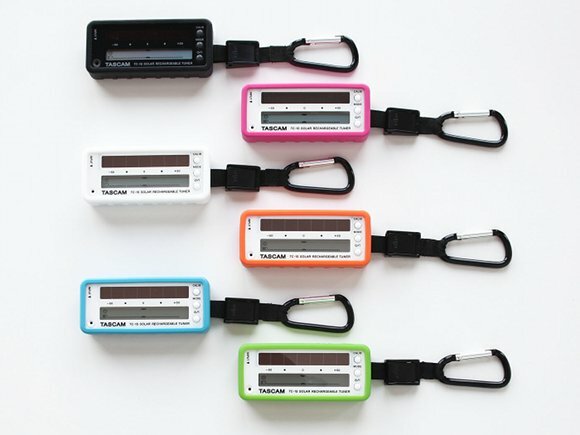 Tascam’s TC-1S is a compact, portable tuner that you can take anywhere. Solar and USB power mean you never have to worry about powering it, either. It’s a cute little design, and with the economic squeeze continuing, I think smart design wins out. Tascam is being a little loose with the term “environmentally-friendly,” however. The press release I received called this “planet-friendly tuning” and claimed “every planet-conscious musician” will need one. I can’t verify whether this is indeed the “world’s first solar-powered tuner” – if anyone knows for sure, let us know. But nothing about this design suggests that it’s especially ecological, beyond the solar panel. Avoiding battery waste is a very good thing, so in that sense, sure, this is environmentally friendly. But you have to then weigh that against power draw from conventional tuners and the impact of manufacturing the panel. More info: Solar panels are definitely nothing to sneeze at. Check out this 2007 report comparing rechargeable to disposable alkalines — and alkaline batteries are far less harmful than the kinds of batteries found in, say, your laptop. Presumably, the major environmental impact of all the gadgets we love has to do with their materials. The silicone in the case may well be low-impact, but it depends on the particular silicone Tascam used, to say nothing of the other ingredients of this device. On the other hand, good design means you consume less, save longer, and get more use out of a device. So in the long run, it could be the practicality of a device like this tuner that helps the planet – because you love and use it for a long time. I’m hardly an expert in environmental design; I’m just pointing out the obvious. But since Tascam raised the issue, let us know what you think. A discussion of what music gear really is planet-friendly is an important one for another day. And as for the tuner, let us know if it’ll go in your bag.